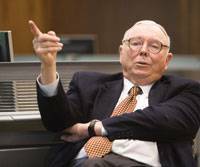 Those who have followed the career of Berkshire Hathaway Vice Chairman Charlie Munger know that he has a long history of using parables to educate the public regarding business, economic, and political issues. By far, the best compilation of Mr. Munger’s thoughts on business and life can be found in Poor Charlie’s Almanack, which is a must read book for anyone seriously interested in Berkshire Hathaway. The latest Munger parable can be found on Slate.com and the story lacks a happy ending. Basically, It’s Over: A parable about how one nation came to financial ruin is obviously a warning regarding the current state of politics and economics in the United States. The reader learns how a fictional nation named “Basicland” grew over a period of two hundred years through a system that mirrored the early United States with encouragement of trade, strong property rights, and a simple banking system. Over time, a casino mentality took hold leading to speculative activity, high levels of debt, and a convoluted tax system perverted by the actions of special interests. Does this sound familiar yet? An elder statesman, the “Good Father” known as “Benfranklin Leekwanyou Vokker”, attempted to talk some sense into Basicland’s leaders, but to no avail. Eventually, Basicland came to be known as Sorrowland as the economic and political system collapsed. “As I move close to the edge of death, I find myself getting more cheerful about the economic future,” Munger, aged 85, said. Munger sees “a final breakthrough that solves the main technical problem of man,” he continued. By harnessing the power of the sun, electrical power will become more available around the world. That will help humans turn sea water into fresh water and eliminate environmental problems, Munger explained. Putting aside the “edge of death” quip, this indeed was an optimistic comment showing great faith in the future prospects of mankind. Upon further reflection, it dawned on me that there may not be any contradiction at all. Mr. Munger could very well be cheerful about the economic future for mankind while simultaneously holding negative views regarding the economic future of the United States. After all, one of the companies in Berkshire Hathaway’s portfolio that is directly engaged in many of the “final breakthroughs” that Mr. Munger talked about is BYD, a Chinese company. Perhaps if the political leaders in Washington are unwilling to listen to “Benfranklin Leekwanyou Vokker”, they will pay attention to Mr. Munger instead. Better yet, someone may want to nominate Mr. Munger for the commission looking into solving the country’s fiscal problems. Of course, this will never happen because common sense is not a highly regarded virtue in Washington today.